We are proud to offer local Hummer and Humvee customers a place to service their vehicles. We have most independent capability to handle all your maintenance and repair needs. We can honor your Extended warranty most models. Although we can not do warranty repairs on your H1 we can propperly repair it or perform maintenance. 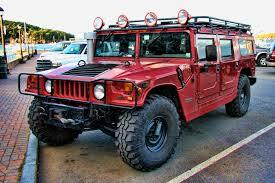 Go ahead and bring your Hummer down to us to for your all maintenace or repair needs. Please keep in mind that we can handle all your service needs for all your GM GMC Cars or Trucks.